Existing OTAs and large travel corporations like Dnata, Carlson Wagonlit travel and others are facing issue of scalability and high costs. With fast-evolving online space, their in-house legacy technology frequently reaches a point of rigidness from where it's difficult or impossible to incorporate new functionalities. Replacing existing technology is expensive, time consuming and carries risk of customer rejection. 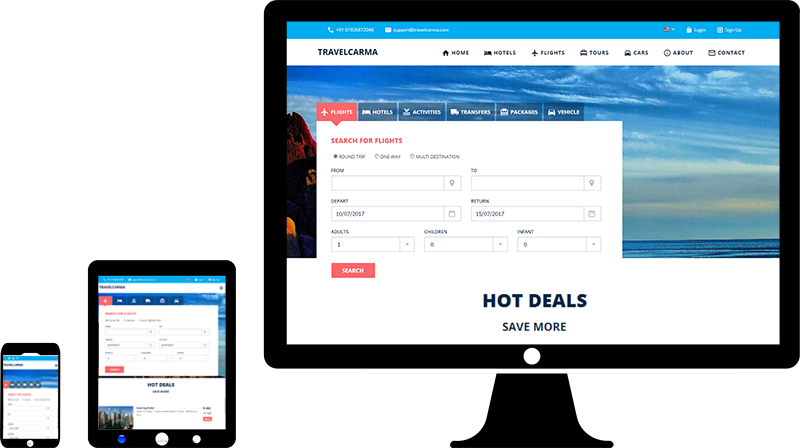 For such large travel corporations TravelCarma provides a completely customizable API based Travel Aggregation and management platform which allows them to build bespoke solutions fully customized to their own needs. The Enterprise version is supplied with all of the functional modules available with TravelCarma but is available only in the licensed model. This allows the companies to integrate the TravelCarma platform into their own infrastructure for security but still get benefits of standard travel solution. As the entire TravelCarma platform and the associated functional modules are services based it makes the whole implementation platform operating system and IT infrastructure agnostic. Our Enterprise solutions are designed to cater to the IT needs of Large Travel Agencies, DMCs, Associations, Agents, Aggregators and Consolidators. Leveraging our 15 years of experience in software development and our domain expertise in the Travel Industry, we offer customizable solutions. TravelCarma Enterprise is an end-to-end Online Travel Reservation and Back-office Management Solution with all the features available in a large OTA. The entire solution can be deployed on your server under a single license. TravelCarma Enterprise is flexible and can be customized as per your needs. It is designed using Service Oriented Architecture (SOA) and is completely modular in nature making it truly scalable and can also easily be integrated with the clients existing IT solutions as and when needed. TravelCarma's corporate solution allows TMCs to provide their customers with an online self booking tool for their travel needs. It is an end-to-end solution covering all the stages of corporate bookings, right from the employee making a request for travel and getting it authorized by the Travel Desk to the actual booking and managing of itineraries. TravelCarma's Travel Data Xchange Switch (TDX) is an OTA (Open Travel Alliance) compliant XML web services based configurable Data Exchange Switch. It provides travel organizations/Web Portals the ability to consume XML or any form of online data from multiple suppliers through a single unified API. The Switch transforms and aggregates the responses and allows rules and filters to be applied to individual or aggregated content. At the core of the TDX is DXchange, an award winning scalable and configurable Data Exchange Middleware Server from Avani Cimcon. TravelCarma E-IMDP is an Enterprise Inventory Distribution platform that provides Tour Operators, DMCs and Travel Trade Associations the ability to manage and distribute contracted inventories across multiple online channels. At its heart is a powerful Channel Management and Distribution engine that allows the aggregation of all the content from different suppliers of individual travel products such as hotels, sightseeing and ground transportation that can be consumed by OTAs via a unified API. Through our 20+ years of experience of building award-winning travel technology solutions, we have developed a strong understanding of what Travel Companies want with a strong focus on how going online would add value to their current business. We have spent years developing solutions that would fit the needs of a majority of businesses across the world. But we also appreciate the need for bespoke solutions to suit specific business needs and workflows. Just tell us what you need and we will build it for you. This is a first-of-its kind solution designed especially for host agencies, helping them tap into their agent network to drive higher revenue, enhance agent loyalty and streamline their operations through the use of cutting-edge travel technology systems. We understand our customers, their needs and our solutions are designed based on our experience and research on what they need to compete, grow and stay ahead of the pack in the industry. Gotadi is the first online travel booking system in Vietnam providing fully automated booking and payment feature for airlines ticket, hotel and tour operators. It also provides integrated travel information feature for travelers. A platform was needed to aggregate and present all the supplier feeds (from their multiple travel suppliers) through one booking engine. They also wanted Flexi fares module for Air. A B2B portal was required to provide a role based access to 300+ B2B travel agents and to manage agent markups and commissions from a single interface. Client wanted to have currency conversion as per the local market rate. A rounding off to 1000 feature was also needed. Multiple payment gateway integration was needed to cater to all customers. They needed a module to Cross-sell Flights and Hotels. Gotadi is also a BSP and a GSA for many Vietnamese airlines. Using TravelCarma solutions, Gotadi was able to provide a complete online booking experience to its clients & B2B agents at best rates. As a result of the solutions provided by TravelCarma, Gotadi now handles 2500+ high-end customers. For Tours, we provided a daily itinerary and complete tour package builder module. We automated the cross sell process and increased the sales. CRS applications supported the customers for online bookings sans any middlemen. We provided a completely automated 'book now pay later' feature. If a user does not confirm the booking, it gets auto-voided thus saving a lot of manual work. Built a third-party XML (OpenTravel based) connection for more inventory and reservations. TravelCarma incorporated an advanced business rules engine controlling which suppliers receive particular requests, how the responses are handled and aggregated other business logic functions including sorting, filtering results, removing duplicates, applying markups, commissions and discounts. TravelCarma built a solution that handles multiple requests in tandem against each supplier system. The business rules engine determines the option parameters sent in each request. This allows large amounts of data to be gathered to support availability checks for multiple properties, or to drive additional search requests when too few hotels are found for the user's exact search criteria. We also provided our inbound XML API services to aggregate feeds from multiple suppliers. Gotadi is a satisfied client who has been with TravelCarma for quite some time now. The key areas of benefit for the company were product usability, features, and performance. They are now one of the major players of Vietnam with 2500+ end customers using their services. Debdab Travel is a fully online travel agency having its operations in Northern Africa region. It provides a one-stop-solution for its customers as well as the agents/partners looking to book flights, hotels, car rentals, activities and transfers. It is a trusted name in the MENA region. Debdab had contracts with multiple travel suppliers and wanted a platform that could aggregate and present all the supplier feeds through a single booking engine. Client had 300+ B2B travel agents and wanted a B2B Portal to manage all the agent markups and commissions from a single interface and provide a role-based access to individual agents. They also wanted a white label solution wherein their agents could have their own B2C portals with Debdab Travel’s feeds. The client wanted to have currency conversion as per local market rate as opposed to the bank rate. Using TravelCarma Solutions, Debdab Travel was able to provide a complete online booking experience at best rates to its Clients & B2B agents. Debdab Travel’s requirement of integrating multiple suppliers was fulfilled by TravelCarma’s API management system. The CRS applications supported the customers for online bookings without any middlemen. A manual currency conversion tool was provided to them wherein they can adjust their local currency as per market rate. Debdab has been using the system for years and is an extremely satisfied client with an agent base of over 400. With the help of TravelCarma, they have been able to capture a sizable market share in the Middle East. Bali Hotel Guide was an incoming tour operator offering hundreds of hotels across Bali, Indonesia as part of its services. This allows users to share hotel list page URL with specific dates and filters with another user. When the other user hits that URL, the hotel list page will load with the same dates and same filter criteria. Deep linking also enabled user to land directly on the details page of specific hotel. Suppose the user has already some specific hotel names to view. We made it possible in two ways: one, by hitting URL directly and another, by Quick Hotel Finder on the header of site. When user selects multiple filters, the selected filters will be displayed on the top of page as active filters. By this, the user can constantly see filter(s) selected. They need not go to filter section again. Remove filters feature was also provided. On the main search page, Advance search popup was provided to show different filters and search criteria on the home page itself. This allows users to select filters they are interested in to search hotels in the same advanced search popup. This enables users to add hotels to their favorites list. The user will be able to see their favorite hotels in future and also if the hotel room will be available at on that date. Users can compare different rooms from the same hotel or different hotels as well. Many criteria are available in this section for comparing rooms and their facilities. We provided Bali Hotel Guide portals in three languages - English, Chinese Simplified, Chinese Traditional. Users can easily switch from one portal to another and switching the language on hotel list and hotel detail page, it lands on the same page with same search date criteria but in a different language. We integrated Trip advisor into the portal for the latest reviews and star rating for all hotels. We provided the client our map-based search feature wherein users can search hotels on a map based interface, as opposed to a list-based one. The search also had filters so users can filter the hotels on map with based on the desired criteria. TravelCarma made it extremely easy for users to search and book their desired hotels and access the latest TripAdvisor reviews for the hotels within the portal. The Tailor is Australia’s premier luxury travel specialist, catering to domestic and international travelers seeking bespoke travel experiences. The client was running his business offline, and courtesy TravelCarma he could take his entire business online, while keeping his business policies and rules intact.